Over the past several years, assistive technology manufacturers have produced eyewear which has promised legally blind individuals the ability to see more than they ever have; however, each device is designed to work with different subsets of users. I have personally tried the Jordy, eSight, NuEyes, and Patriot ViewPoint Glasses. 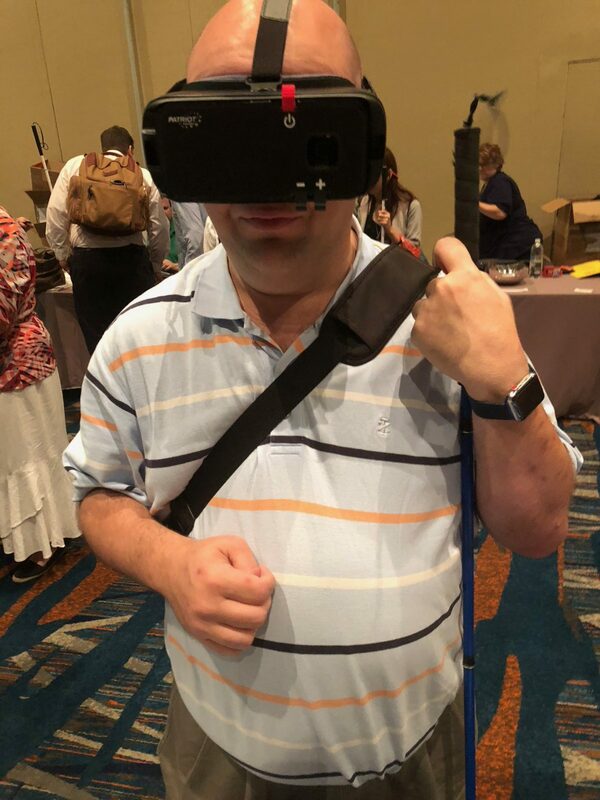 While attending the 2018 National Federation of The Blind convention, I had the opportunity to use the patriot glasses, and was impressed with the product. The Patriot ViewPoint takes an old idea of using camera technologies in a glasses-based form to the next level by adapting current technologies into an amazing product that uses a Samsung Gear VR headset and a Samsung Galaxy phone to magnify what is viewed using the camera. the ViewPoint has been configured with the most up-to-date technology, which offers large eye lenses for the wearer to see through and the Samsung camera in the phone provides the ability to zoom in on objects up close and far away without loss of detail. The Patriot ViewPoint offers some amazing features and some of the best hardware out there, but it also has its drawbacks. The glasses do not have a sleep mode, so they must be rebooted every time they need to be used. Since they use a Samsung Gear VR headset, the glasses are heavy. This could be problematic if one wanted to use them for an extended period of time. The ViewPoint does not have an object locator mode. This would allow for the user to zoom out and find an object then zoom back in to see what the object is. It does take some time to zoom. You must flick on the touch sensitive area for each zoom level. The ViewPoint is a bit pricy; however, it is more affordable than most devices in this family of products. Everyone knows that I love new technology, but I must say that the Patriot ViewPoint has changed my life. I would guess that it has changed the lives of many other low vision users out there. By reading this article, you might surmise that the drawbacks are severe; however, it is worth noting that this technology can change over time with software changes and advances in new technology. I personally put these glasses on at the convention, and I could not believe what I could see. I could see what people were doing in the court yard while being three stories up, the intricate details of the hotel bed’s headboard and much much more. If you are looking for a solution like this then I would really recommend the Patriot ViewPoint over any other device. It has changed my life, and I think it will change yours. I would also like to thank Mr. John Palmer of Patriot Vision Industries for creating such an amazing product, and helping those of us who can use this product to see what we have never seen before.